We’ve all heard the old adage that beauty is only skin deep. Meaning that a person's character is more important than their appearance. And while I agree with this saying 100%, reality is that in today’s world it’s important how you look too. Now we all want to age gracefully and most of us toil at this feat daily. Our skin, the biggest cell in our bodies is exposed to the weather, pollutants and even toxins in our food. 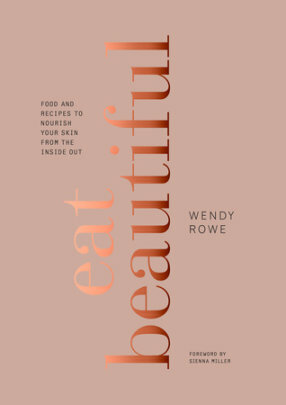 The book; “Eat Beautiful”, by Wendy Rowe is about this very subject. Now Wendy is a make-up artist and beauty expert that travels around the world who realized that “to get perfect skin and maintain it, you need the right balance inside and out”. She has devised over 70 delicious recipes that are simple and easy to prepare. They are organized the by the four seasons starting with Spring first. The premise here being that eating local; fresh, organic produce is best for you. There is also a section on skincare and beauty treatments with recipes for homemade toners, scrubs, masks, mists and a coconut oil cleanser. Since it is winter here in the states I prepared Wendy's Miso soup from the winter chapter. In her introduction for this recipe she talks about this being a great soup for a busy or fasting day. I followed her directions to a T. The ingredients are as follows; seaweed, shallot, miso paste, tofu, scallions, watercress, ginger and red pepper flakes. Both my husband and I enjoyed this very much. The seaweed added so much flavor to the broth. Will be making this satisfying broth again soon. haha! you are so right. Thanks for stopping by John. Hi Natalia, this is a good basic soup, the broth is flavorful and light and you can add lots of veggies. Sounds like a wonderful book. I love that it's divided into seasons! Thanks Chris, it's a great start the beginning of the year right book. I love this ~ I'm heading to Amazon now! The book sounds fantastic Cheri, and the soup presentation looks so lovely! Miso soup is a quick standby in my household, though it is generally topped with some scallions and small tofu cubes and perhaps a bit of added dashi. Thanks for sharing! Thanks Peggy, will have to add dashi next time, sounds likem the perfect way to finish. what lovely and nice post !! So true Gingi, so true! That cover is stunning. Love the photo of the soup! I agree totally with eating seasonally. What a great idea for a book. And so true, clean eating and eating seasonally is something I'd like to do better with. I've never made miso soup and this bowl looks beautiful. I love learning more about skin care and aging gracefully - sounds like this is a good book for just that! Fasting is also an interesting thing - I wonder how many people fast other than for religious reasons? I like the part about aging gracefully too. Thanks Tricia! The book sounds really fun and miso soup looks very tasty! Thnaks Angie, it is a great book. Love miso soup! And I love good skin! After all, you are what you eat! you are so right, thanks Abbe! What a beautiful and fresh tasting bowl of soup! My hairdresser has been following a fast and cleanse regime recently and I applaud the effort. Not sure if I could do it! Thanks Susan, not sure if I could either, I am having a hard enough time cutting out the sugar. Your soup looks wonderful! The book sounds like a winner...we all need to pay more attention to what we eat and drink. A gorgeous bowl of soup! And if it helps my skin look better, that's a huge bonus! Thanks Liz, I feel the same way. Thanks Monique, this was my first attempt at making miso and I really enjoyed it. I agree with one of your commenters - the cover is beautiful! I have never made miso soup - and I am not sure why, because I like it a lot! Hi David, this was my first attempt and I enjoyed the broth very much.Take care! This sounds like a great book, Cheri! I like that it has recipes for skincare, too! Thanks Nancy, this was a beautiful cookbook. I am posting a wild rice salad from Eat Beautiful this next week. I loved the recipes and the information in this book. Your soup looks amazing! Oh Can't wait to see your post, that salad looks amazing! Thanks Debra! What a gorgeous soup! And even if we don't focus on our looks, the food we eat can make such a difference in how we feel. I titally believe that how you eat impacts a lot! Interesting book. Thanks Inger, I do too. Have a great week. Thanks Anu, this was my first time preparing miso, will be making again. The purpose of an anti aging skin care regime is to re-hydrate the skin and keep it as youthful as possible for as long as possible.